The dizziness (vertigo) that usually accompanies Meniere’s can come on quickly with no warning or be preceded by hearing problems and tinnitus. Vertigo can be so severe that it can cause the person to have what is called a drop attack, meaning he loses his balance and falls. 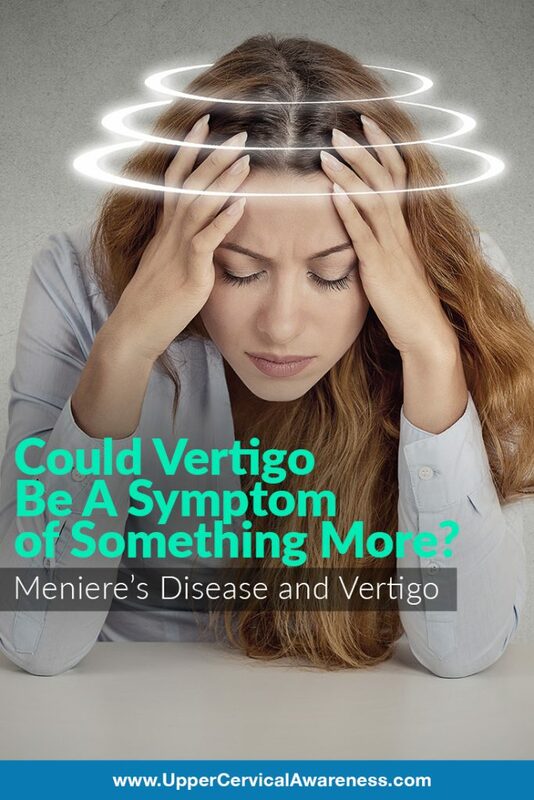 Why Does Meniere’s Disease Cause Vertigo? The above-mentioned symptoms are brought about by too much fluid in the inner ear. The inner ear is responsible for balance and sending signals to the brain about where the body is located. It keeps track of every movement made. Therefore, if fluid buildup interferes with the receptors in the ear and does not allow them to send proper signals, vertigo can be the end result. What Provides Natural Help for Vertigo? Medical doctors may begin treating a patient by prescribing medicine that is used for nausea and motion sickness. Sometimes, they even suggest diuretics to help in reducing fluid in the inner ear. Other doctors may advocate lifestyle changes, such as reducing caffeine and salt consumption as these can cause a person to retain fluid. Some of these may be helpful in controlling the symptoms, but what about the underlying cause. Why is the ear retaining fluid in the first place? To find this out, a person may need to visit an upper cervical chiropractor. When examining the necks of our Meniere’s patients, we often find a misalignment in the upper cervical vertebrae. A misalignment here creates pressure on the brainstem, further hindering signals to and from the brain and body. This can be why the ear acts as if it must retain fluid. Once we are able to correct this misalignment, the body begins to heal itself and function properly again. The fluid becomes regulated, and Meniere’s sufferers may find a measure of relief from their symptoms, vertigo in particular.